It has come into the notice of SBP that visually impaired persons find it difficult to recognize and distinguish amongst different Pakistani currency notes. SBP, for the information of the general public and specifically visually impaired persons, reiterates that Pakistani currency notes have specific features to help the visually impaired persons to identify the genuineness of currency notes and to distinguish between different denominations. All currency notes of Rs.20 and above contain braille features on its front side that help to determine the denomination of a currency notes. For this purpose, raised dots and small horizontal lines are printed on the left bottom corner just above the banknote serial number. This feature makes banknote denominations easily distinguishable by rubbing the thumb against these raised features. The braille features in each denomination appear in this manner: Rs.20 has one line, Rs.50 two lines and Rs.100 has three lines while other higher denomination notes have dots as braille feature. Specifically, Rs.500 has one dot; Rs.1000 two dots, and Rs.5000 three dots. All braille features on currency notes of all denominations of Rs. 20 & above are printed through Intaglio process, due to which they appear raised and on the front side of the note only. Thus, a visually impaired person can easily infer the denomination of the banknotes by feeling the raised printing as well as its genuineness. All Pakistani currency notes have denomination-wise tiered sizing. Each currency note has the same width of 65 mm whereas lengthwise, each banknote is exactly 08 mm longer than the preceding denomination. Thus the highest denomination banknote of Rs.5000 is 48mm longer than the lowest denomination currency note of Rs.10. The incorporation of a number of strong security features including braille features in banknotes are aimed at facilitating general public. To create awareness about currency note features among the masses, SBP provided complete details on its website (available at http://www.sbp.org.pk/finance/index.asp). Moreover, it has launched Videos and a Smartphone application on security features of currency notes which provide information on security features of currency notes both in descriptive and pictorial forms. It may also be mentioned that 16 field offices of SBP-BSC spread across Pakistan, conduct awareness campaigns all over the country. These sessions are usually arranged in high traffic areas and involve in depth briefing on currency note features. 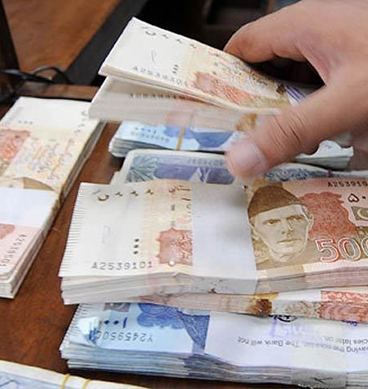 To augment the awareness of banknote features, SBP has mandated the prominent display through posters containing security features in every commercial bank branch under instructions to guide customers of the currency note features, as required. The SBP BSC field offices are also arranging special awareness sessions tailored towards the needs of visually impaired persons. These sessions will be organized in collaboration with social welfare organizations/trusts that are dedicated to serving different factions of the general public, especially the visually impaired who are an invaluable part of the Pakistani society. SBP also urges general public to educate visually impaired persons about features of Pakistani currency notes wherever possible.